Lets admit the fact that WhatsApp groups can get a bit annoying sometimes especially if people start talking on off-topics rather than discussing about relevant topics pertaining to the groups. Whatsapp knows your grievances and in order to tackle this issue, the company has come up with a very good solution. As of today, Whatsapp has introduced a new “Mentions” feature for group chats that lets you tag people within the conversation. The feature which is similar to the one found in Twitter, Instagram and Telegram can be useful especially for large groups. But that’s not the only new feature that Whatsapp is getting in this update. If you are getting annoyed by increasing number of messages in the group chat but you can not mute the chat either, well, now you can! 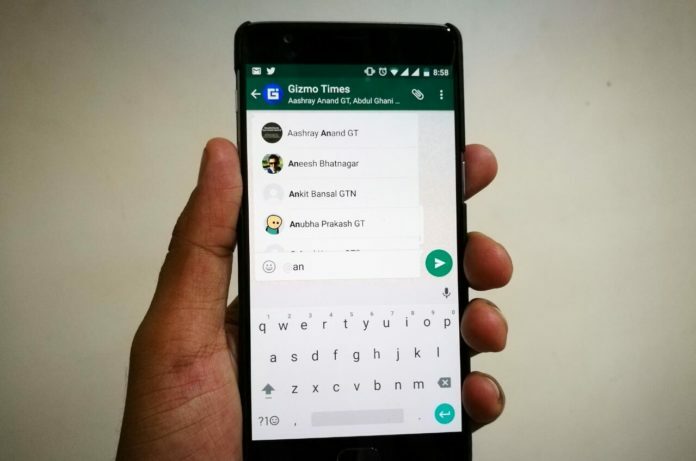 The new Whatsapp chat allows users to still get notification in muted chats if a member has mentioned him/her using “@”. Whatsapp previously added the option to quote messages, a welcome change by the messaging giant. By introducing this feature, people might not feel that annoyed with a thousand messages waiting for them in group chats. The mentions feature comes with the latest Whatsapp update version 2.16.272 for both iOS and Android devices. Let us know your thoughts on this new feature in the comments below. Cheers!